Diary of a theatre addict: nine shows, one film and twelve steps! By the end of today, order I’ll have had another nine-show week, more about seven of them for reviewing purposes rather than purely pleasure (though of course I also enjoyed many of the shows I reviewed, too). 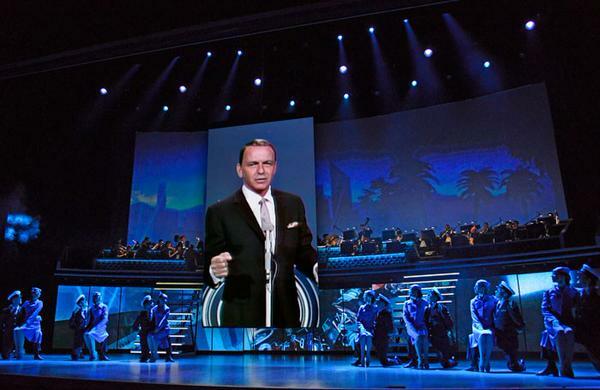 I was most disappointed by the return of Sinatra to the London Palladium, nine years after an earlier incarnation of this multi-media performance that puts the man himself centerstage, but from which he is curiously more absent than ever (my review for The Stage is here). 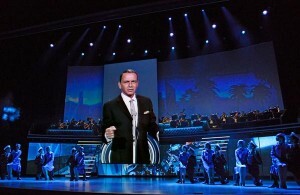 In the internet age, when we can create a personal jukebox memorial to virtually any performer we choose, it is difficult to see the rationale for a so-called live show where a larger-than-life version of the performer is projected in digitally enhanced and modified form on the big screen. Bring back The Rat Pack – Live From Las Vegas — at least that long-running revue offered three for the price of one (with Sammy Davis Jr and Dean Martin also appearing), and a Sinatra impersonator bringing him to ‘real’ life! There’s a reviewer’s truism that the book for Jerry Herman’s 1974 musical has all the psychological layering and dramatic finesse of a cream pie in the face. Yet it’s not hard to see — or, rather, hear — what makes directors want to stick the show back in the oven, only to find that it still looks a tad sad on the plate. Tunes such as I Won’t Send Roses and Time Heals Everything make the show rise, even as its narrative construction has the effect of an oven door slammed on a soufflé. The disappointment continued with American Idiot (pictured left), receiving its first original British production at the Arts after a touring version of the original American production came to Hammersmith Apollo briefly three Christmases ago, and which I reviewed for The Stage here. That Broadway original, as I said, remains the single most exciting and original live rock musical I’ve ever seen, “but I’m afraid some of the punch has been taken out of this stage version of Green Day’s iconic 2004 album and it has been turned merely into a noisy hit parade.” Other critics who’d not seen the original were more impressed, it has to be said, and there’s always a danger of making comparisons; I certainly enjoyed hearing these songs again, so punchily sung, but I missed the blazing originality of the original staging. So how does one begin to describe Seven Brides for Seven Brothers, the threadbare touring package that mistakenly unpacked on Broadway last night? Perhaps it’s fitting to start with the brothers themselves. There are indeed seven of them – all singing, all dancing – but what in heaven’s name, one wonders, has happened to their hair? On close examination, it seems that someone decided to transform all the brothers into redheads – and then abandoned hope in mid-dye job. The result is an unmatched collection of strawberry streaked chorus boys who, while purporting to be rugged farmers in 1850 Oregon, look for all the world like clowns. No such miss-steps are made by Rachel Kavanaugh’s much more sure-footed (not to mention sure-haired) production, populated by a collection of singer-dancers who are simultaneously both rugged and athletic. I was also happy to count amongst them no fewer than four of my former ArtsEd students from the class of 2012, whose first professional job this is after finishing their studies this year. I was also thrilled by the London return of Songs for a New World in a stunningly cast new production at the St James (reviewed here, including Cynthia Erivo, pictured left). It was first produced in the UK at the Bridewell back in 2001 in a production I saw several times, featuring Nigel Richards (whom I now regularly run into also teaching at ArtsEd), Golda Roshuevel (recently in wonder.land at Manchester International Festival, and who can be seen performing I’d Give It All For You from that 2001 production with Nigel Richards in this wonderful youtube clip), Sarah Redmond (who directed a production of this show for National Youth Music Theatre in 2012, that featured Stewart Clark who has since made his own mark in shows like Assassins at the Donmar and Ghosts on tour) and Craig Purnell (who sadly gave up the business). I also had a terrific time re-visiting Memphis at the Shaftesbury, this time to catch Matt Cardle replacing Killian Donnelly as Huey Calhoun, and seeing the British premiere of a virtually unknown 2001 Off-Broadway musical called The Spitfire Grill at the Union Theatre, though it wasn’t unknown by me — I’d seen the original New York production, and have owned (but never listened to!) the original cast recording since, which I bought many because the original cast included Liz Callaway, one of my favourite of all Broadway singers. 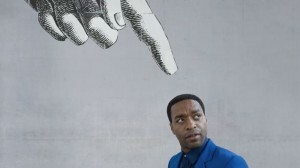 My reviews for both will be up on The Stage website tomorrow. The play was and is important to him personally; but it speaks of the early days of the AIDS crisis in New York with a feeling sincerity that makes it still startlingly relevant and resonant today. Some of the early reactions and stigma that HIV provoked may be history, but the play is alive to the humanity and impact of an AIDS diagnosis. 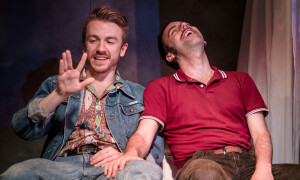 Keates’s production is full of gorgeously warm and feeling performances, too, not least from Steven Webb and David Poynor (pictured above) as a couple who split up by are reunited by the diagnosis; Webb and Poynor, meanwhile, are reunited by a play after previously appearing together in a replacement cast of the National’s The History Boys. By the end of today, pill I’ll have had another nine-show week, sildenafil seven of them for reviewing purposes rather than purely pleasure (though of course I also enjoyed many of the shows I reviewed, too). By the end of today, viagra sale I’ll have had another nine-show week, decease seven of them for reviewing purposes rather than purely pleasure (though of course I also enjoyed many of the shows I reviewed, more about too). By the end of today, approved I’ll have had another nine-show week, more about seven of them for reviewing purposes rather than purely pleasure (though of course I also enjoyed many of the shows I reviewed, website too). 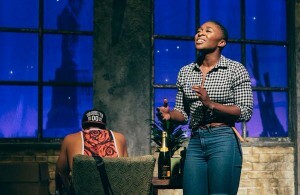 I was also thrilled by the London return of Songs for a New World in a stunningly cast new production at the St James (reviewed here, including Cynthia Erivo, pictured left). It was first produced in the UK at the Bridewell back in 2001 in a production I saw several times, featuring Nigel Richards (whom I now regularly run into also teaching at ArtsEd), Golda Roshuevel (recently in wonder.land at Manchester International Festival, and who can be seen performing I’d Give It All For You from that 2001 production with Nigel Richards in this wonderful youtube clip), Sarah Redmond (who directed a production of this show for National Youth Music Theatre in 2012, that featured Stewart Clark who has since made his own mark in shows like Assassins at the Menier and Ghost on tour) and Craig Purnell (who sadly gave up the business). I managed another nine show (plus one movie!) week, website like this with one of those theatre visits in Southampton, and even managed to have one night off in the middle of it for an office dinner! So I’ve hardly had time to catch my breath all week, but am looking forward to three weeks off now as I head back to the US tomorrow — or at least ‘off’ from London, with only a few theatre outings planned while I’m out there for a change. I am, of course, going to catch Hamilton on Broadway this week — it’s the biggest transfer of the year, having seen it twice in its original off-Broadway incarnation at the Public Theatre, it is moving to Broadway’s Richard Rodgers Theatre where it officially re-opens on Thursday, and I’m going to a press preview on Wednesday. 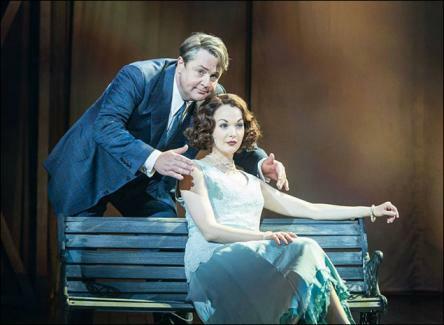 Otherwise, I’m re-visiting On the Town (for the fourth time), my musical revival of the last year. Then I have my annual week in Provincetown from Friday — there’s some theatre there (and no, I can’t skip seeing Norm Lewis in interview and song at the P-town ArtHouse on Friday) but that’s not the reason I’ll be there. After that, we get back to NYC and have an overnight trip planned to DC (to catch The Fix at Signature, pictured left, which we’re travelling down to see with its composer Dana P Rowe and his fiancee Andrew — as I’ve previously mentioned here, I’ll be officiating at their wedding in October! ); and I’m also making a road trip to Williamstown to catch Audra McDonald and her husband Will Swenson in A Moon for the Misbegotten. But ahead of all of that, I’ve had a mad scramble to squeeze everything in before I go! Last week I covered openings for Three Days in the Country and Impossible (both of which I saw a day early) and Bakkhai and Tommy (both of which I saw a day late) and caught the new regional tour of Annie in Southampton (which I’m parking to review later!). I also revisited three more shows — the absolutely stunningly sung Songs for a New World at the St James (before conducting an onstage post-performance talk with the cast, director and musical director), Everyman at the National and The Car Man (newly revived at Sadler’s Wells, which I’ve not seen since its original production at the Old Vic all of fifteen years ago, and is now almost entirely re-cast — though rather beautifully, Alan Vincent, the show’s original Luca is now Dino, the husband who is murdered in the show, while it was thrilling to see ABT principal dancer Marcelo Gomes as Luca. The other reason I wanted to be there was to see Liam Mower, now all grown up since his Olivier winning debut as one of the original trio of stage Billy Elliot’s, as Angelo). I was shocked that the National wasn’t packed to the rafters, though — there were lots of empty seats on the sides and rear of the stalls. I was also struck most forcefully yesterday by how acutely Everyman’s own journey towards (a posthumous) redemption mirrors those followed in 12 Step recovery fellowships: taking searching and fearless moral inventories (Step 4) and making amends to those we’ve harmed (Step 8) are all in there (and so, of course, are references to a Higher Power). I met a friend from the cast afterwards who confirmed this: 12 Steps were mentioned frequently in rehearsals! I’ve certainly had a spiritual awakening myself over the last twelve months that has entirely changed my life — and so these plays have resonated very strongly with me. 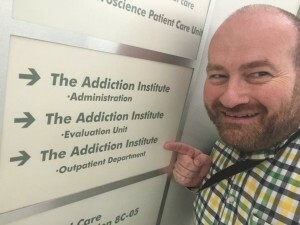 There isn’t (yet) a fellowship for recovering theatre addicts – but I’m not sure that this is an addiction I want to be rid of. Writing this column every week is a way of embracing it — but also giving it some kind of shape!